Lock-making was a well established cottage industry in the original South Staffordshire area of the British Midlands by the middle of the seventeenth-century. Its success was largely due to the local abundance of iron ore, and charcoal from Cannock Forest (the charcoal industry subsequently decimated the forest by 1686) and latterly, coal – the essential ingredients for producing the iron plates necessary for fabricating lock components. During the Industrial Revolution lock-making burgeoned in South Staffordshire with Willenhall establishing itself as the centre of Britain’s lock making industry. The area produced tens of thousands of locks annually for both domestic and foreign markets. Even so, lock-making manufactories were predominantly small family concerns operating from backyard workshops. At its peak in the mid-eighteenth-century most households in the area were involved in the industry. “More locks are made here than in any other town in England or Europe“. The 1770 Directory of Willenhall lists 290 locksmiths between the towns of Bilston (8), Willenhall (148) and Wolverhampton (134). Twenty-four different branches of lock-making are listed in the directory, five are specifically ‘cabinet lockmakers’, four are ‘iron lockmakers’, five are ‘brass lockmakers’ and one is a ‘ Till Lockmaker’. While the directory lists the locksmiths’ primary pursuits, it is highly likely that many more locksmiths also made cabinet locks, evidenced by the sheer quantity of cabinet locks produced. Until the basic Bessemer process was perfected in 1876, steel was expensive and problematic to produce in any quantity. Iron plate sufficed for the majority of lock parts, so it is interesting to see a ‘John Fisher – steel plate maker’ listed in the 1770 directory. The most likely explanation is, using the cementation process, Fisher probably produced steel in sufficient quantities to make back springs for local locksmiths. The lock-making trade inevitably met with mechanisation: In 1796 Isaac Mason introduced a hand-operated fly press to Willenhall, capable of punching lock parts. The hand press eventually gave way to the steam-powered press and along with it; steel sheet superseded wrought iron as the principal material. Yorkshireman, Robert Barron, patented a lever lock in 1778 and whilst it offered advanced security, it didn’t sound the death knell for the simple back spring lock which continued in production until the late nineteenth-century. Key-makers are noticeably absent from the 1770 Directory of Willenhall which would suggest keys were brought in from elsewhere. However, by 1818, two ‘key makers’, two ‘key smiths’ and one ‘key stamper’ are listed in the Willenhall area. Key making was an entirely separate trade from lock-making, primarily because the raw materials and processes it involved differed. A fine grade of cast iron smelted from iron filings and swarf was required to cast the delicately detailed keys, the rough castings being finished with files and then sold to locksmiths for final fitting to individual locks. The work of drilling the pipes and filing or chiselling the ward slits was often carried out by children. Warded locks have existed in Britain since Roman occupation, but didn’t proliferate until the mediaeval period; spurred by the growth in population, wealth and the resultant increase in personal valuables. Wards are simple thin, blade-like obstacles, staked – concentric to the drill pin – to the backplates of basic back spring locks. Early iron wards were susceptible to rusting and many subsequently disintegrated. Prior to the widespread use of steel, brass and copper succeeded iron for the making of wards and are usually distinguishable by their unique oxidised colour (fig. 1, c). A key bit with a matching slot to clear each ward is required to open the lock, thereby providing a moderate increase in security. Warded locks are fairly rudimentary and even with single or multiple wards, were easily circumvented by enterprising thieves. Fig. 1 shows the backplate of an eighteenth-century iron warded back spring lock. The staked back rim tangs (a), riveted drill pin (b) and staked, single ward (c) are just discernible. Fig. 1. Iron warded back spring till lock, obverse. 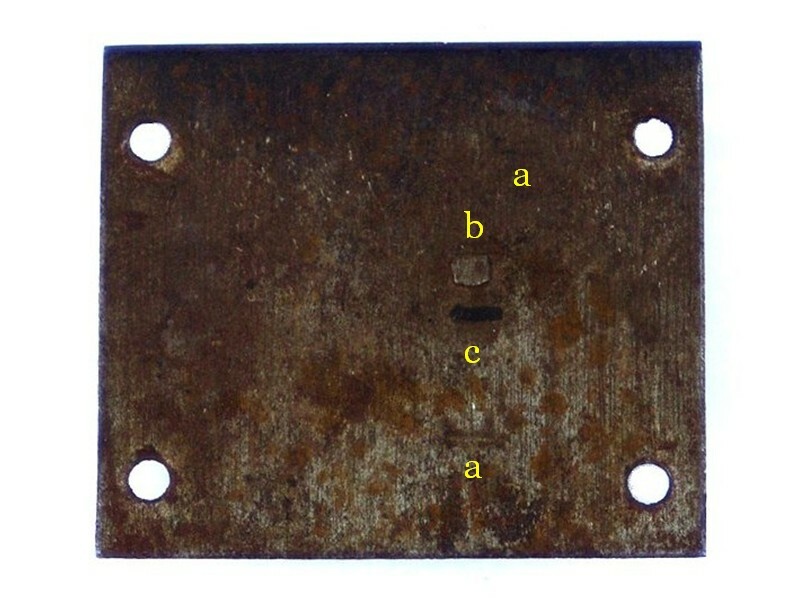 All over filed surfaces are indicative of eighteenth-century iron locks: Later steel locks have a dull appearance and typically exhibit deformed and dragged machine-stamped edges. Fig. 2. Iron warded back spring till lock, reverse. The partially dismantled lock (fig. 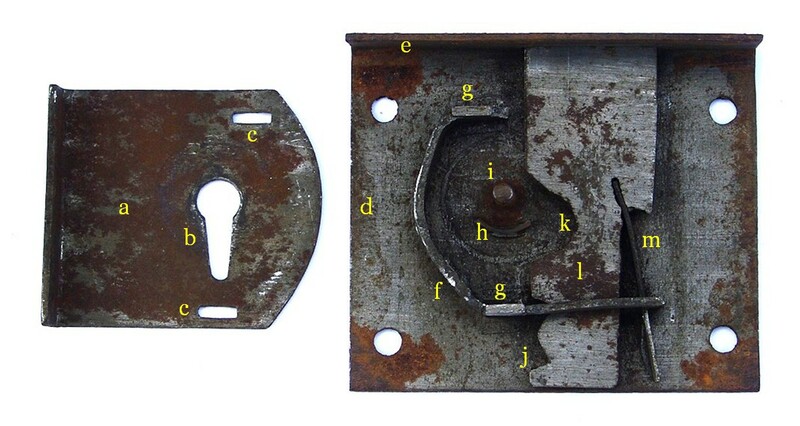 3) shows the case (a), keyhole (b), tang slots (c), backplate (d), selvedge (e), back rim (f), back rim tangs (g), copper ward (h), drill pin (i), notch (j), talon (k), bolt (l) and back spring (m). Fig. 3. Iron warded back spring till lock internals. The back rim is attached to the backplate via two tangs – in this instance, directly below the two case tangs. 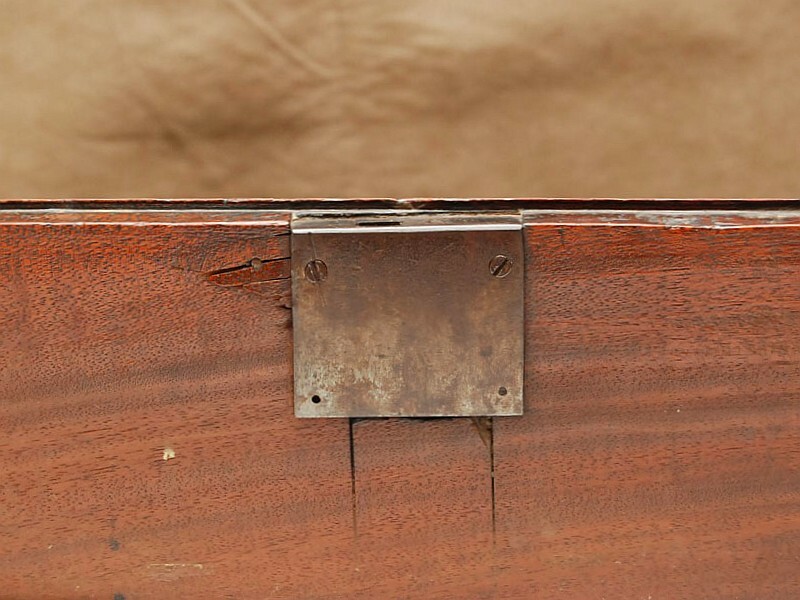 The back rim tangs are staked to the backplate, whereas the tangs securing the case are riveted. Fig. 4. Gates in the selvedge and back rim. The bolt comprises a piece of iron – thicker than the other lock components – that was chiselled and filed to shape. 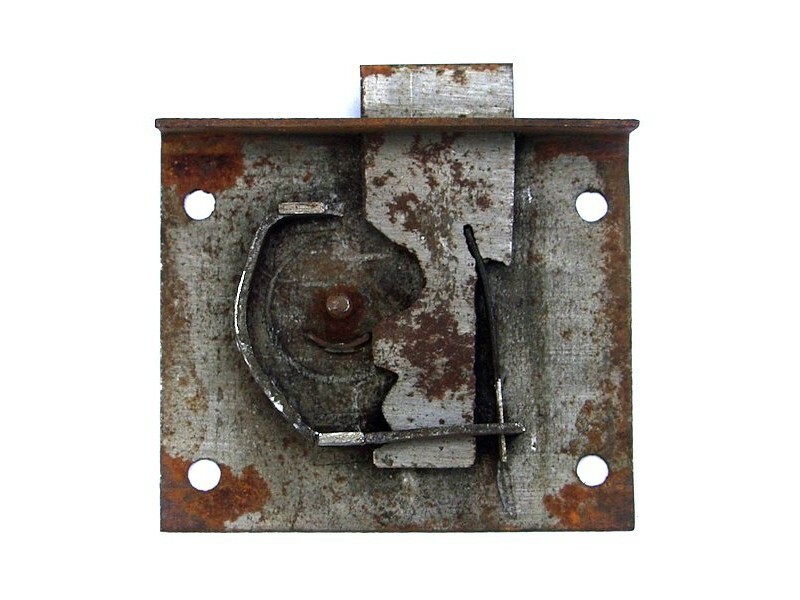 On early locks, a slit was made along the back of the bolt and the resultant thin strip of iron was bent outwards and separately hardened to form a spring – hence the term ‘back spring lock’. 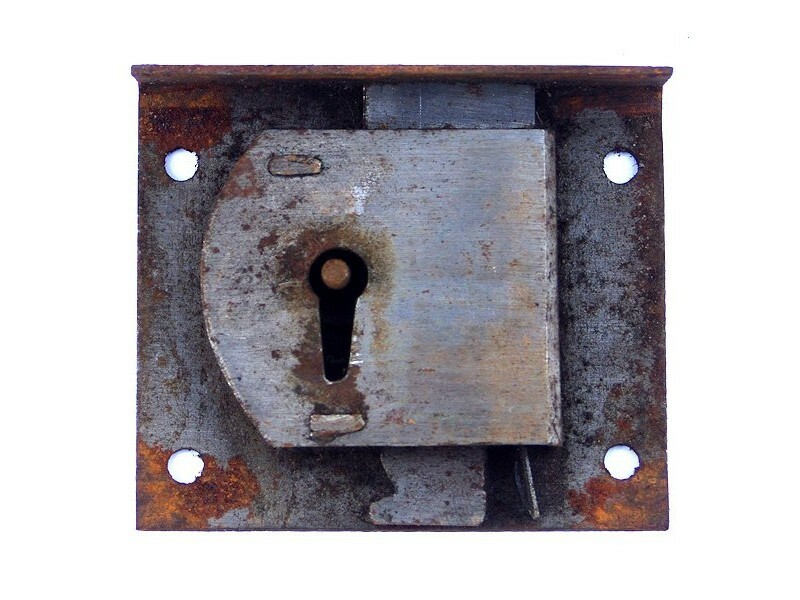 Wrought iron, no matter what heat treatment it is subjected to, won’t produce a spring of any lasting quality: Many of these early locks failed. Later bolts were equipped with a separate steel back spring which was inserted into a slit and then staked in place (fig. 4). Fig. 5 shows the bit (a), pipe (b), collar (c) and bow (d) of a typical eighteenth-century iron ward key. This key has a second ward slit cut into the back of the bit which suggests it may have been made with the intention of attaching a ward to the underside of the case. Another possible explanation – and a commonly plied deception – is that the second slit is redundant and was created purely to give the impression of a higher level of security. Fig. 5. Iron ward key. To throw the lock’s bolt, the key is inserted through the keyhole, onto the drill pin and rotated anti-clockwise. The bit engages the talon, raising the bolt up through the gate in the selvedge. At a predetermined point, the bit, still rotating anti-clockwise, clears the talon and simultaneously, under pressure of the back spring, the end notch clicks into place against the gate in the back rim, thus securing the bolt in the locked position (fig. 6). Fig. 6. The thrown bolt. The till lock illustrated above is a type of ‘cut’ lock, that is, the body of the lock is cut into the back of a till or drawer. 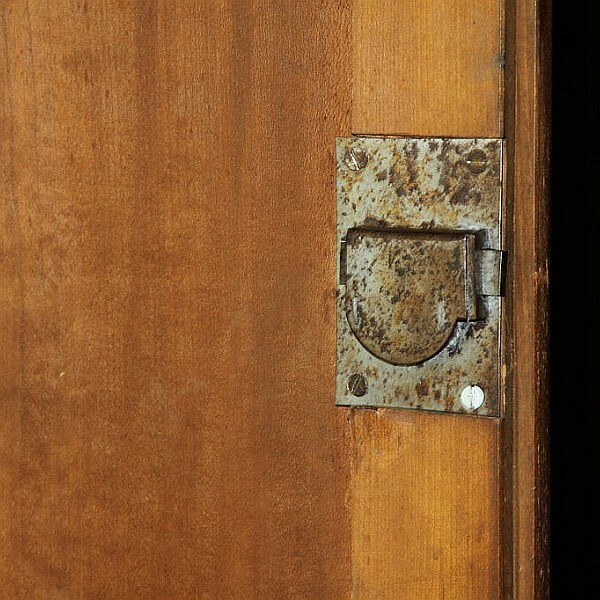 Cut cupboard locks were also common in the late seventeenth-century and eighteenth-century, though being more conspicuous than drawer locks; the backplates – and often the cases – were predominantly made from brass. Bolts were always made of iron. 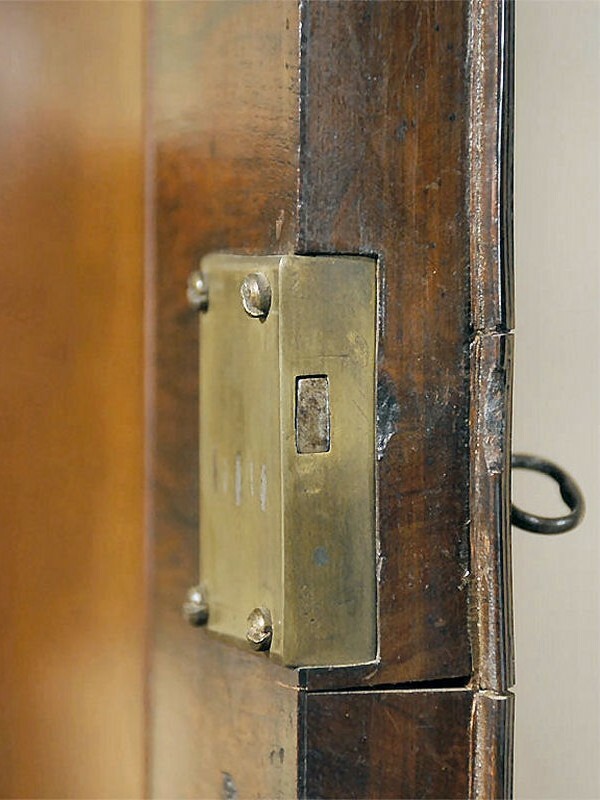 Surface-mounted ‘straight’ cupboard locks were sometimes used on bookcase and cabinet doors that held heavy mirrors, where cutting-in a lock might compromise the integrity and strength of a narrow door stile. Straight brass and steel locks were commonly used on ordinary and vernacular cupboards by way of reducing labour costs. The methods used to fasten till locks to drawer fronts varied from a couple of tacks to four screws. 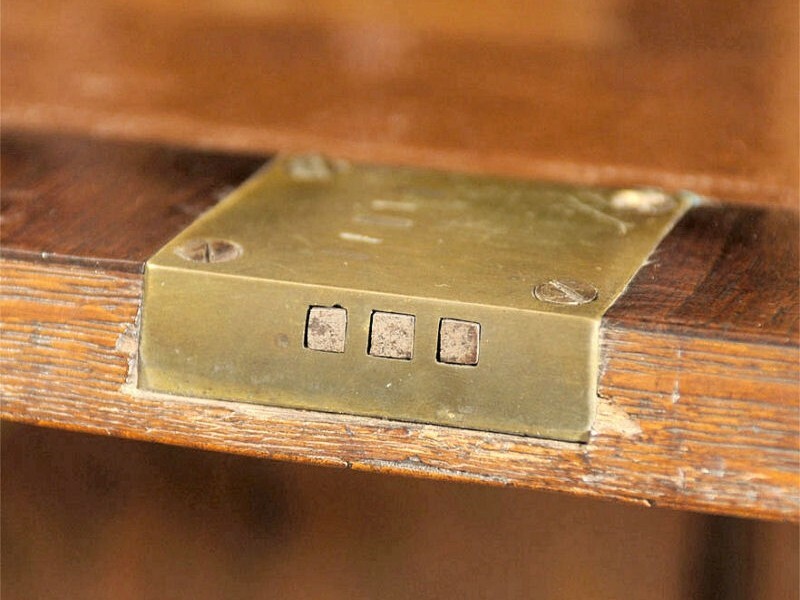 Drawer locks on some early furniture were equipped with only a pair of holes about half an inch below the selvedge; just large enough to accept a couple of wrought nails. Most locks were provided with four nail holes, though in practice, the lower two were invariably left vacant. Handmade iron wood screws offered a superior grip to that of nails, and thus greater security, but in the late seventeenth-century and eighteenth-century, screws were an expensive commodity. Their use was also largely restricted to major urban centres and localities close to their manufacture in iron ore-rich areas. As the canal network and mechanisation of wood screw production improved towards the close of the eighteenth-century, screws became more readily available and affordable and so screws commonly replaced the two upper nails. The upper holes were made larger and sometimes countersunk, though more often not. The remaining lower two nail holes were still customarily unused (fig. 7). Fig. 7. Iron till lock on a mahogany chest drawer, circa 1750. Cast brass cupboard locks and bureau fall locks were attached with a full compliment of iron screws. Early cupboard locks were usually attached with cheese-head iron screws (fig. 10). 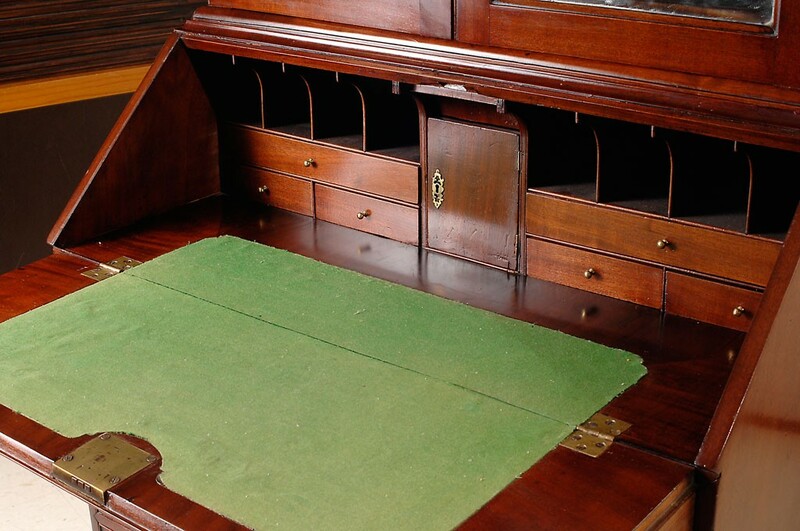 Note none of the screw slots are aligned – an insidious practise of the Victorian era! Fig. 8. Brass fall lock on a walnut bureau-bookcase, circa 1710. Fig. 9. Brass fall lock on a mahogany bureau-bookcase, c. 1760. Fig. 10. Brass cut cupboard lock attached with cheese-head iron screws, circa 1710. Fig. 11. 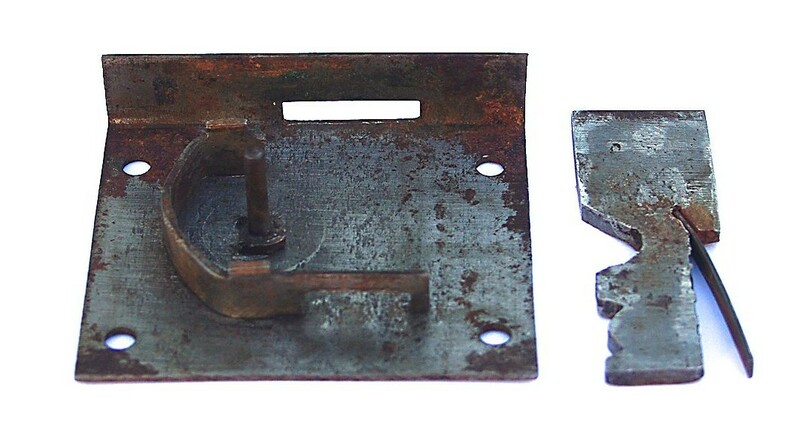 Iron straight cupboard lock attached with flat-head iron screws, circa 1780. “Before the rise of factories into which workmen might be collected, and their labour more healthily regulated, Willenhall lock-making was always conducted in small domiciliary workshops.”Frederick Wm. Hackwood, The Annals of Willenhall, Wolverhampton, 1908, p. 158. J. A. Berry, Regional Furniture, vol. XV, 2001, p. 65. “The coal in the neighbourhood, which is considered the best in the kingdom for the smith’s forge, on account of its peculiar intensity of heat…” William Pitt, A Topographical History of Staffordshire, Newcastle-under-Lyme, 1817, p. 154. Dr. Plot, Natural History of Staffordshire, 2nd ed., 1686. Dr. Richard Wilkes’ second diary, 1739-1754, the Wellcome Institute Library, London. Sketchley and Adams, The Tradesman’s True Guide or, An universal directory, for the towns of Birmingham, Wolverhampton, Walsal, Dudley, and the manufacturing villages in the neighbourhood of Birmingham, 4th. ed., Birmingham, 1770. “Lockmaking was carried on in Bilston as early as 1590, when the Perrys, the Kempsons, and the Tomkyses, all leading families, were engaged in the trade.” Frederick Wm. Hackwood, The Annals of Willenhall, Wolverhampton, 1908, p. 158. Jim Evans, Willenhall – The Town of Locks and Keys, 1999. William Parson and Thomas Bradshaw, proprietors, Staffordshire General & Commercial Directory, Manchester, 1818, p.347. This entry was posted in Cabinet Fittings and tagged back spring lock, basic Bessemer process, Cannock Forest, charcoal, cut lock, Dr. Robert Plot, Hearth Tax, iron wood screws, lock, lock-making, locksmith, rolling mills, South Staffordshire, straight lock, Willenhall, Wolverhampton, wrought iron. Bookmark the permalink.